Auto Character Setup (ACS) 2 kit is a production-ready, automatic rigging solution for bipedal characters. You can quickly adjust the flexible, general-purpose biped rig to work with a wide range of characters, and enjoy streamlined processes for binding, weight painting and applying corrective morphs. Reuse animation data between scenes or even different characters with the included library of poses and actions. Apply motion capture data with just a few clicks using an optimized retargeting workflow, and animate on top using both FK and IK controls. Once you’re ready, flatten your characters into a simple hierarchy of joints with a single click, ready to export into external applications such as Unity or Unreal Engine. ACS has an excellent track record of being used in all kinds of productions ranging from illustrations, animated commercials, short films to games. Troll Bridge is a cinematic adaptation of the short story by Terry Pratchett. Auto Character Setup 2 was used to rig and animate one of key characters in the film - Mica. Mica rig is based on an ACS1 rig with a lot of custom rigging on top (including a full face rig). Stellar work from Troll Bridge VFX supervisor Christian Bloch. Auto Character Setup 2 is main rigging and animation tool on the on going, live action short film Robot Attack by Brian Vowles. The film is featuring Brian's sons in confrontation with a big, bad robot. Farrah Rogue is a deathmatch game being developed by James Guard and his Epsilon Studios. 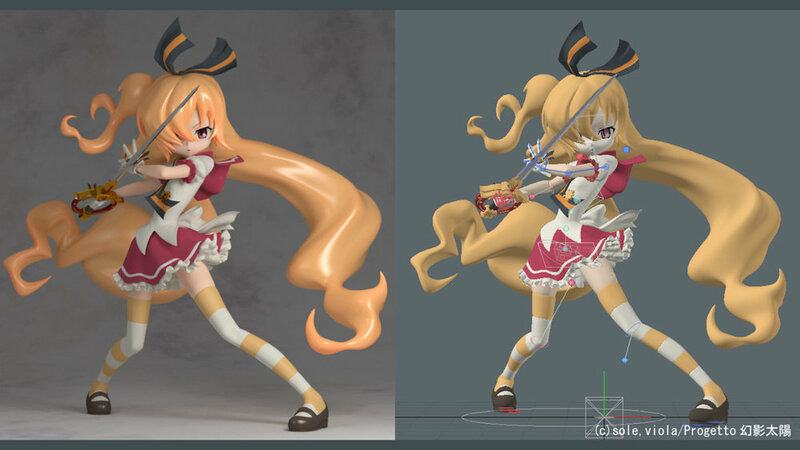 Character animations for the initial version of the game were done in MODO using ACS. Jeremy Goes to the Fair is a mobile game developed by Apptastic Software (makers of Channel Chimp plugin for MODO). All the character animations in the game were made using ACS. General-purpose bipedal rig complete with IK/FK blending. Modular rig design allowing easy removal of unneeded parts (fingers, etc.). Squash and stretch controls for limbs and torso. Retargeting support with the ability to animate over motion capture using both FK and IK rig controls. Intuitive pick-walking setup for easy selection of animation controls with the keyboard. Rigs are transportable and can be opened and animated on any system with or without ACS installed. Rigs are extensible and can be customised with standard MODO rigging tools. Non-linear workflow - rig proportions can be readjusted at any time, even after animation process has been started. Character contexts for fast switching between different tasks (animation, weighting, pose sculpting, preview). Preset-based poses and actions library for storing and reusing animation data across scenes or even different characters. Poses and actions mirroring tools. Backup and restore functionality for weight maps. Ability to use rigid meshes to attach non-deforming elements to character joints. Artist-friendly workflow for applying corrective morphs using joint influences and MODO’s native sculpting tools. Bind mesh proxy mode for faster playback performance and the ability to pose a character with rig controls hidden. Robust selection tools that make it easy to select various parts of the rig (supports MODO’s native item selection sets). Animation tools for editing keys for either entire character, selected controls or selected channels only. Dedicated Animate Palette increases animation efficiency. Baking characters so they can be exported to external applications such as Unreal Engine or Unity. Support for Mixamo’s rigged characters (ability to reuse characters’ proportions and weight maps). Snapshot command for freezing character’s current pose into a separate mesh layer. Robust presets for storing and reusing various character data such as guide proportions and character settings. Improved preview tools for creating animation previews with a minimum number of clicks.